+ Logbook of The World Now on Facebook! The ARRL National Convention -- held in conjunction with Ham-Com in Plano, Texas June 10-11 -- featured the ARRL EXPO, a large exhibition area within the main exhibit hall. The ARRL EXPO featured a project building activity and the ARRL Youth Lounge, while booths highlighting various ARRL departments and programs such as Education & Technology, Emergency Communications, Radiosport, ARRL VEC, ARRL Equipment and Club Liability Insurance Programs, Regulatory and Legislative Programs, ARRL Development and the ARRL Foundation were on hand. The exhibit area was anchored on one side by a huge ARRL store where attendees could browse and buy the latest ARRL publications, join or renew their League membership. ARRL EXPO was supported by a team of 73 ARRL volunteers, officials and staff. Read more here. One of the most exciting things at the Dayton Hamvention each year is the introduction of new products. This year was no exception. From HF transceivers to receivers to test equipment to station equipment, there was a plethora of new products just about everywhere you turned. Read more here. Registration is now open for the new online Introduction to Emergency Communications course (EC-001). Course information, including a description, pre-requisites and instructions on how to register are available on the ARRL website. Slots are still available for the section which begins Friday, July 29; the registration deadline is Sunday, July 17. ARRL Education Services Manager Debra Johnson, K1DMJ, explained that she is also looking for qualified volunteers to provide support as Mentors for the course, as well as Field Instructors who want to lead classroom sessions to instruct the course material. The new Introduction to Emergency Communications course includes updated content from the previous Basic Emergency Communications Level 1 course, as well as some content previously included in the former Level 2 course. The EmComm training program has been restructured to offer two courses: This enhanced basic course for EmComm volunteers who want to serve as part of an ARES® response team and the management course -- Public Service and Emergency Communication Management for Radio Amateurs (EC-016) -- for those who are serving in ARES® leadership and management roles. Read more here. Now is the time to start getting information out to the public about your ARRL Field Day activities. ARRL Field Day -- the largest on-the-air operating event -- is the one of the best opportunities of the year for showing our Amateur Radio capabilities to the public. ARRL Media and Public Information Manager Allen Pitts, W1AGP, notes that the ARRL has made many media materials available for local use. "Our visibility to the public is important in antenna, band preservation and texting issues, so we encourage you to use this opportunity to showcase what Amateur Radio can do," he said. Download an audio PSA that can air on your local radio stations here. Get a press release, a government proclamation template and invitation letters that you can use to invite your local officials to your Field Day site here. Find high-definition video files suitable for airing on your local television stations here. 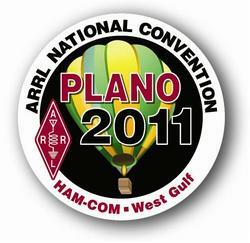 Get more information on ARRL Field Day, including the 2011 ARRL Field Day logo and operating tips here. More info, the logo and tips are here. Find a Field Day station near you here. ARRL Field Day is June 25-26. At the 2007 Annual Meeting of the ARRL Board of Directors, the ARRL National Emergency Response Planning Committee -- led by then-ARRL First Vice President Kay Craigie, N3KN -- presented a report to the Board that outlined how the League should respond to emergencies. One of the key concepts proposed by the committee was the Major Disaster Emergency Coordinator (MDEC) appointment. The idea was to have a manager who would coordinate Amateur Radio operations, operators and resources in supporting served agencies during a major disaster relief operation when Section and Regional ARES® assets are overwhelmed, similar to operations performed in the Hurricane Katrina response. The MDEC's line of authority would be derived from the ARRL's Emergency Preparedness Manager -- currently Mike Corey, W5MPC -- and would parallel the affected area's Section Managers. The MDEC position was envisioned to be a continuous appointment, but would only be active when called upon by the Emergency Preparedness Manager. The ARRL Emergency Communications Advisory Committee (ECAC) -- established at the 2010 Annual Meeting -- is currently drafting appointment protocols and requirements for the MDEC. As presently conceived by the committee, there will be several MDECs geographically arranged by each ARRL Division. The geography, and hence the actual MDEC headcount, is being determined at this time. The committee will report its recommendations and draft appointment guidelines to the ARRL's Programs and Services Committee. Read more here. May 31 marked the last day at ARRL HQ for ARRL Information Technology Manager Jon Bloom, KE3Z. Bloom -- an ARRL Life Member who had been with the League for 27 years -- resigned from the League to pursue other opportunities. Michael Keane, K1MK -- hired in 2009 as a programmer in the IT Department -- has been selected as the new Information Technology Manager. Read more here. For the past 10 years, the US Office of Personnel Management has designated the ARRL to participate in the Combined Federal Campaign (CFC). In that time, this campaign for federal government civilian employees, US Postal Service workers and members of the military has generated more than $170,000 for ARRL programs since it first became an option for giving by federal employees to the League. The CFC provides an easy way to support ARRL's effort to represent its members and all radio amateurs. Similar to the United Way, the CFC encourages individuals to pledge by payroll deduction to non-profit organizations of their choice. 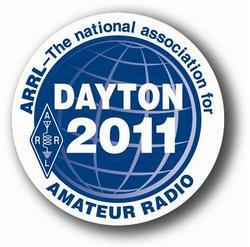 The ARRL encourages eligible radio amateurs to consider the League when designating campaign recipients. Payroll deduction through the CFC is an easy way for participants to support ARRL over and above their annual membership. Such contributions support programs that are not funded by member dues, enriching ARRL's ability to serve its members and all of Amateur Radio. Those wishing to select the ARRL to receive all or part of their payroll deductions should designate organization 10099 when completing their CFC donor forms. Donations to ARRL can be designated for Diamond Club contributions, the ARRL Spectrum Defense Fund or the ARRL Education & Technology Program. Donors may also make unrestricted contributions to the League. One important note: Since the CFC does not provide the ARRL with the names of individual donors, the ARRL Development Office would appreciate a copy of the donor form to ensure that each contribution is applied according to the donor's wishes and the contribution or pledge can be properly acknowledged. The Sun, as seen on Thursday, June 16, 2011 from NASA's SOHO Extreme Ultraviolet Imaging Telescope. This MDI (Michelson Doppler Imager) image was taken in the continuum near the Ni I 6768 Angstrom line. The most prominent features are the sunspots. This is very much how the Sun looks in the visible range of the spectrum. Tad "The damp of the river fog rises after the Sun goes down" Cook, K7RA, reports: The average daily sunspot numbers for the past week declined by more than half, nearly 52 points to 35.1, when compared to the previous week. The average daily solar flux declined nearly 12 points to 90.1. 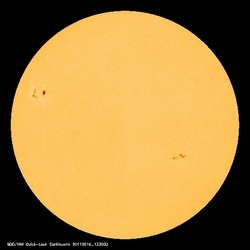 NOAA and the USAF predict rising solar flux for the near term, with solar flux at 105 on June 16-20 to 110 on June 21-22, and then dipping below 100 after June 28. Predicted solar flux for ARRL Field Day weekend is 105 on June 24-26. The predicted planetary A index for June 16-25 is 5, 7, 8, 5, 8, 8, 5, 12, 15 and 10, followed by 5 on each day through the end of June. It seems that a recurring coronal hole may disturb our Earth's geomagnetic field, with the maximum effect on June 24 -- the day before Field Day -- but geomagnetic conditions should be very quiet by Sunday, June 26. Our inbox is exploding this week with all the e-mail concerning the meeting of the Solar Physics Division of the American Astronomical Society at New Mexico State University in Las Cruces, and the report from the meeting about predictions for a major drop in solar activity, which you can read here. But support for this position isn't unanimous, and in tomorrow's bulletin we'll look at a report by astrophysicist Douglas Biesecker that is skeptical of this prediction. Look for more information on the ARRL website on Friday, June 17. For more information concerning radio propagation, visit the ARRL Technical Information Service Propagation page. This week's "Tad Cookism" is brought to you by Henry Wadsworth Longfellow's Paul Revere's Ride, in celebration of Battle of Bunker Hill (June 17, 1775). Last week, the ARRL added a Logbook of The World page to social networking site Facebook. With almost 300 fans, the page is growing every day. The LoTW page on Facebook offers the latest LoTW news, as well as comments from users. Have you checked out the ARRL Facebook page lately? With almost 18,000 fans, it's the most popular Amateur Radio page on Facebook! Do you own a D-STAR or APCO-25 transceiver? When it comes to QSL cards, do you buy from a printer or make your own? Have you ever built a kit that included Surface Mount Devices (SMDs)? When was the last time you used Amateur Radio to assist a non-emergency public service event (such as a footrace or parade)? Visit the QuickStats page and be sure to bookmark it in your browser. Results from this QuickStats poll will be published in the September 2011 issue of QST on the QuickStats page, located in the rear advertising section of the magazine. Along with monthly poll results, QST QuickStats offers colorful charts and graphs that highlight interesting Amateur Radio statistics.